For use with Papanicolaou stain; a general tissue stain. Ready-to-use. All of our Earle's Balanced Salt Solution contains: Potassium Chloride, Sodium Chloride, Sodium Phosphate Monobasic, and D-glucose. Some formulations may contain additional components. Use the table below as a quick reference for identifying the one that best suits your application. All of the solutions are prepared 1X strength. EDTA, Disodium Salt, Dihydrate, A.C.S. Description: This buffer is intended for heat-induced antigen retriever on formalin-fixed paraffin-embedded (FFPE) tissue sections prior to application of antibodies. In IHC most commonly used fixative like formalin mask tissue antigens (cellular, membrane and nuclear) by cross-linking process, this results in poor or no staining in IHC. The use of this buffer on FFPE tissue section improves accessibility of antibodies to tissue antigens. Intended Use:1X buffer solution is intended for heat-induced antigen retriever in IHC. Please refer to primary antibody protocol. Reagent: 10 X, pH 8.5 antigen retriever solution. Stain selectivity for nuclei. Ready-to-use. EMbed 812 has the same characteristics as Epon 812, physically, and provides the same results in preservation, handling, curing and sectioning. EMbed 812 may cause etching on selected plastics. All formulas for mixing and using Epon 812 can be applied to EMbed 812, e.g. Luft's procedure, Mollenhauer's and EPON-ARALDITE mixtures. Please see listing in Embedding Media Kits. Please see listing in Adhesives and Mountants. Solubility: 44.0% Water; 2.0% Alcohol; 25.0% Cellosolve; 27.5% Glycol; 0.0% Xylene. Used with Hematoxylin for showing cell nuclei in embryos and kidneys. Conn, "Biological Stain" 9th ed., The Williams and Wilkens Co., Baltimore 1977, pg. 7. Studies show that in order to get good results in positive staining of sections, the removal of cured epoxy (embedding material) as well as the reduced-osmium (fixation materials) from the sections is necessary; especially when double fixation with an Aldehyde and Osmium tetroxide is employed to process specimens for E.M. We offer a CURED-EPOXY-REMOVER kit, which removes the polymerized resin as well as the reduced-osmium. The structure of the resin free section will remain unchanged. Toluidine Blue and Basic Fuchsin. For staining semi thin sections of epoxy embedded tissues. Spurlock, B.O., (1966) et al., Am. J. of Clin. Path. Solubility: 10.0% Water; 5.0% Alcohol; 7.0% Cellosolve; 8.25% Glycol; 0.0% Xylene. Due to the supply shortage of ERL-4206 ERL-4221 has now been specially formulated to replace it. ERL 4206 is one of the main components of the low viscosity (Dr. Spur) embedding resin kit. ERL-4221 is a Cycloaliphatic Epoxide Resin. Suitable for all routine histology/cytology preparations. EUKITT classic has been on the market place since 1953 and has proven to be useful due to its distinct characteristics: Fast Curing, Crystal clear optically with a universal refractive index (1.49). As well, it offers good fluidity, low shrinkage and is easy to use. The EUKITT classic may be used either manually or in an automated mode. The product holds up well in the presence of water and trace levels of Alcohol. It is very well suited for all pale color preparations as well as colorless preparations. EUKITT has a neutral pH and offers extended storage times of all slide preparations for years without any sign of cracking or discoloration. The medium itself is colorless and does not change the color and or the structure of the samples mounted with the medium. EUKITT is temperature resistant to heat and cold (-170°C), as well as humidity, daylight and UV light. Once the EUKITT bottle is opened it is advantageous to seal the bottle tightly as soon as you are done using it. If the medium becomes thickened you can add a small amount of xylene to dilute it. EUKITT Classic was formulated for use in Automated Coverslipping machines. Slide preparations with EUKITT Classic exhibit minimal discoloration and perfect drying without any bubbles and streaks. With EUKITT Classic ideal viscosity (500-750 mPa's) it is a perfect formulation for all automated machines. Supplied in a wide neck, unbreakable aluminium bottle. The product has a shelf life of 3 years. EUKITT Neo is xylene-free and characterized by fast curing, crystal-clear optics, low fluorescence, favorable refractive index, good fluidity and low shrinkage. The preparations are stable without cracking and discoloration. EUKITT Neo is colorless and does not change shape, structure orcolor of the material to be examined. 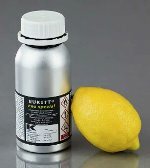 The unique formulation of this version of EUKITT uses self sustaining raws that have no solvent base at all. The pleasant odor facilitates working in the laboratory. Highly viscous xylene free mounting medium. EUKITT Neo Special is another xylene free product. EUKITT Neo Special is characterized by faster curing and slightly higher viscosity than EUKITT Neo. Users of EUKITT Classic will appreciate the xylene free replacement. The product retains crystal-clear optics, low fluorescence, favorable refractive index, good fluidity and low shrinkage properties. The preparations are stable without cracking and discoloration. EUKITT Neo Special is colorless and does not change shape, structure or color of the material to be examined. The use of sustainable, renewable raw material as a solvent completes the modern formulation approach. The pleasant odor facilitates working in the laboratory. Supplied in wide neck, unbreakable aluminum bottles. The product has a shelf life of 3 years. EUKITT UV is the first mounting media of its kind to eliminate the need to be concerned about the vaport pressure of the solvent used. EUKITT UV is a UV-curing mounting medium with all the well-known beneficial properties of the gold standard series EUKITT and a true innovation in the world of mounting. EUKITT UV does not contain any solvents, therefore only 50% of the usual amount is needed compared to conventional systems. While using EUKITT UV almost no shrinkage can be detected. The mounting medium may be used on tissue sections in non-polar solvents such as xylene or xylene substitutes as well as directly on sections in pure alcohols (EtOH, iPrOH, etc.). 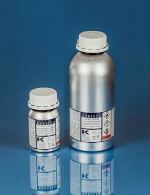 The viscosity of EUKITT UV is very user-friendly. After being applied to the tissue, the cover glass can be placed as usual. Subsequently, a transfer break of at least 120 sec. is maintained prior to irradiation in order to ensure an ideal penetration into the tissue. When using the specially tuned LED CCFL UV curing machine EUKITT UV cures in just 30 seconds. EUKITT UV-R has a lower viscosity that EUKITT UV, is fast spreading and compatible with almost all clearing agents like xylene, iso-paraffine, petroleum ether, limonenes, etc. In addition, it can be directly applied on sections from absolute EtOH or I-PrOH. The ability to remove UV-R under classic conditions (24 hours xylene) is appealing for many applications. This product can be used manually or in cover slipping machines. MICROFIX™ follows the proven, xylene-based approach of O. Kindler ORSAtec. 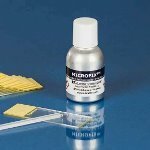 MICROFIX™ is characterized by fast curing, crystal-clear optics, low fluorescence, ideal refractive index, good flowability and low shrinkage. MICROFIX™ is colorless and does not change shape, structure or color of the material to be examined. These characteristics are already known from the classic EUKITT. What is new is the streamlined and optimized synthesis and filling process, and a still further optimized selection of our raw materials. EUKITT EMS 4400 LB is a single-component resin that polymerizes under UV light. It is used for embedding and preparing of thin ground sections. Thin ground sections for medical and technical applications can be produced. It is the latest embedding medium, and a worldwide innovation, due to its unique properties. EUKITT EMS 4400 LB is specially developed for thin ground sectioning technology. It completely passes through hard and soft tissue. Due to its mechanic strength, it is extremely suitable for the thin sectioning technique. The hardening of the embedding medium is done by UV light of a wavelength of 365 nm with 2 x 9 W. The exposure takes place from two sides. During the exposure within the given time (see instruction manual/operating instructions) temperatures of 50°C will not be exceeded. Fast staining is possible with all known methods, and with the same high quality. EUKITT EMS 4400 LB does not contain monomers, therefore the vapour pressure is very low. As a consequence the user is not bothered by intense, toxic smell. EUKITT EMS 4400 LB is characterized by crystal-clear optics with a favorable refractive index, good fluidity and low shrinkage. Every common fixation for light microscopy is possible for this outstanding embedding system. The drainage and infiltration of the tissue is possible via an ascending range of alcohol/EUKITT EMS 4400 LB (for this, see theinstruction manual). Embedding with EUKITT EMS 4400 LB can be performed with standard techniques. Take care when filling the embedding mold, so that no air bubbles are enclosed. Polymerization (hardening) is done by exposure through a lamp system of 365 nm and 2 x 9 W to comply with the steps in the instruction manual The entire polymerization takes a maximum of 4 hours. 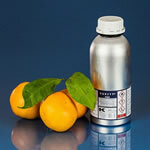 EUKITT EMS 4400 LB is available in 500 ml units only. The main advantage of this dye is its resistance to fading. Mammalian tissue stain for visualizing collagen, muscle, cystoplasma, cells and cornified epithelium. Kornhauser, Stain Tech., 18,95 (1943); 20, 23 (1945); Lillie, Arch. Path., 29, 705 (1940). Modified Feulgen stain for visualizing chromosomes in root tips and other meristematic tissue. DeTomasi, Stain Tech., 11, 137 (1936). Used in plant histology. O. Conn, "Biological Stains" 9th ed., Williams & Wilkens Co., Baltimore, 1977, pp. 252-3; Haynes, Stain Tech., 3, 40 (1928). Please see listing in Prepared Staining Solutions. Ferric Chloride, Hexahydrate, Reagent, A.C.S. Hendy, R. (1971). Electron microscopy of lipofucsin pigment stained by the Schmorl and Fontana technique. Histochemie, 26:311. Please see listing in Reagents for Histology. This polycationic derivative of ferritin is useful in labeling negative charges on cell surfaces and to study membrane structure. Cationized ferritin is prepared by coupling ferritin from horse spleen with N,N-dimethyl-1,3-propanediamine (DMPA). Sterile filtered solution in 0.15M NaCl. Ferritin Concentration: 10mg per ml, coupled with DMPA. Rapid staining technique that provides high-contrast fluorescence microscopy imaging of resin embedded samples, reminiscint of low magnification transmission electron microscopy. Simply mount your sections on glass slides, air dry, and overlay with 100 microliters FIRM for 30 seconds, wash and coverslip with water or an aqueous mountant. View in Rhodamine channel of a standard wide field Fluorescence Microscope. FIRM staining is unique in that the brightly fluorescent dye infiltrates the resin, revealing tissue structures in negative relief, with extremely high contrast and resolution.